Animal training requires a range of different skills and qualities. In order to be a successful trainer, you'll need to form a bond with the animals in your care. That comes from a lot of hard work. It can be a very challenging and rewarding experience, regardless of what type of animal you're working with — whether it's birds, dogs or marine mammals. Marine mammal trainers use their knowledge of animal behavior to train and care for a variety of marine species. 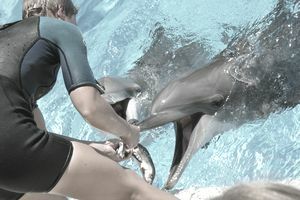 Marine mammal trainers use operant conditioning (positive reinforcement techniques) to train the animals in their care. They also are responsible for providing appropriate physical and mental exercises to keep animals healthy and happy. Other duties for marine mammal trainers may include diet preparation and feeding, keeping accurate health and behavior records, ensuring the habitat is properly maintained, and addressing the public during educational programs and demonstrations. Additionally, trainers teach the animals behaviors that make it safer and easier to collect medical samples, perform exams, and administer medications. They usually assist the veterinarian with medical procedures and exams. Marine mammal trainers must be physically fit and capable of working outdoors in changing weather conditions and extreme temperatures. It is common for trainers to be on call to work as needed on nights, weekends or holidays. They may also be called to assist with sick or injured animals. Marine mammal trainers may specialize in working with a specific type of marine mammal such as dolphins, whales, or seals and sea lions. Some trainers may spend a large portion of their time involved with public education or demonstrations, while others work primarily behind the scenes, doing research or other duties. A marine mammal trainer may advance to supervisory positions, such as facility director or curator, though an advanced degree may be necessary for consideration at some institutions. There are also marine mammal training opportunities with the U.S. Navy Marine Mammal Program. Patience: Training involving any type of animal requires a lot of patience. Animals can often pick up on your frustration and may not perform as well as expected, so it's a good idea to leave that at the door when it's training time. Commitment: You need to stay committed to the task from beginning to end. If you find certain techniques just aren't working, try something else rather than giving up altogether. After all, not every animal responds the same way to the same training techniques. Strength: Because of the demanding surroundings — of being in open water or in a pool — you'll need to be physically fit. In certain cases, you may need to do some heavy lifting of animals and/or equipment as well. While a college degree is not mandatory, it's very difficult to become a marine mammal trainer without one. Common majors for marine mammal trainers include animal science, marine biology, animal behavior, zoology, psychology, and biology. Another well known educational option is the Exotic Animal Training Management program at Moorpark College in California. This 7-day-a-week associate degree program is 22 months long and accepts about 50 students per year. Degree recipients have gone on to work at most of the major zoos, animal parks and in Hollywood. Marine mammal trainers may have prior practical experience from employment as a marine biologist or zookeeper. Aspiring trainers will usually volunteer or intern at a marine mammal facility to gain experience. Hands-on experience is essential for those seeking entrance to this field. Prior experience working as a dog trainer, veterinary assistant or in another animal-related field is beneficial for those unable to gain experience specifically related to marine mammals. In addition to having a degree and practical experience in the field, most marine mammal facilities require their trainer applicants to have strong swimming skills and proof of scuba diving certification. Once hired, successful applicants must complete an intensive training course under the direction of experienced trainers. Trainees learn the training techniques and management methods of the facility. They also have the opportunity to familiarize themselves with the facility’s animals and other members of the training team. Many marine mammal trainers are members of a professional marine animal group such as the International Marine Animal Trainers’ Association (IMATA). The group was founded in 1972. Another group is the Society for Marine Mammalogy (SMM), which was founded in 1981. It currently has more than 2,000 members from more than 56 different countries. These groups provide members-only website access, industry publications, and job postings. SimplyHired.com listed the average salary for marine mammal trainers with the U.S. Navy program as $71,035 as of November 2018, though this is generally considered on the high end of the marine mammal trainer salary range. While the U.S. Bureau of Labor and Statistics (BLS) does not separate marine mammal trainers out from the general category of animal trainers, a 2017 study found the mean annual animal trainer salary to be $28,880. The lowest 10% of animal trainers earned less than $19,610 while the highest 10% earned a salary of more than $56,000. The three states with the highest number of available animal trainer jobs were California with 2,250 jobs, Florida with 1,520 jobs and New York with 1,170 jobs. The mean annual salaries for these states were $39,700 in California, $36,710 in Florida and $36,870 in New York. There is extremely strong competition for marine mammal trainer positions nationwide. As relatively few new marine parks and aquariums open each year, the total number of marine mammal trainer positions is not expected to grow significantly. This fact, combined with the high level of interest in this career path, ensures a very high level of demand for any positions that should become available in the field. It is also important for aspiring marine mammal trainers to realize that long-distance relocation is frequently necessary to secure a position in this field.